Originally printed on January 17, 2019 in the Brent & Kilburn Times. 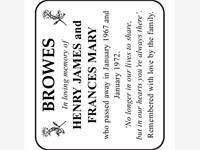 BROWES In loving memory of HENRY JAMES and FRANCES MARY who passed away in January 1967 and January 1972. 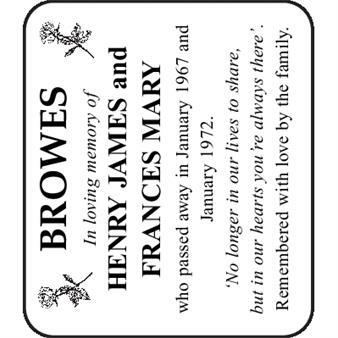 ‘No longer in our lives to share, but in our hearts you’re always there’. Remembered with love by the family.